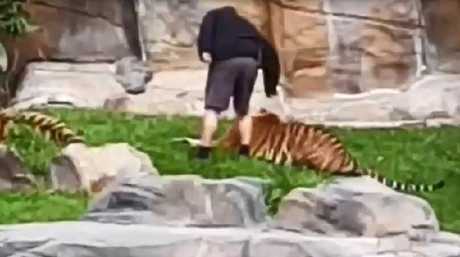 DREAMWORLD has hit back at claims its staff mistreated one of its prized tigers after a video went viral on social media. Posted by a concerned viewer onto Instagram overnight, the footage shows two handlers in the pen with two tigers, Akasha and Kai. 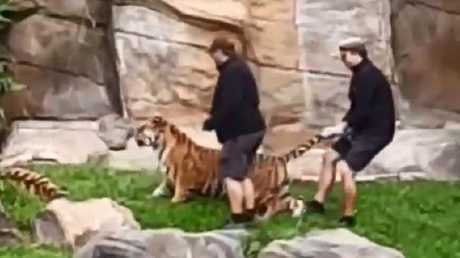 One handler appears to grab the tail of one of the tigers as it stands and moves towards the second tiger. A second handler then comes from the left hand side as the tiger stops walking and crouches down. 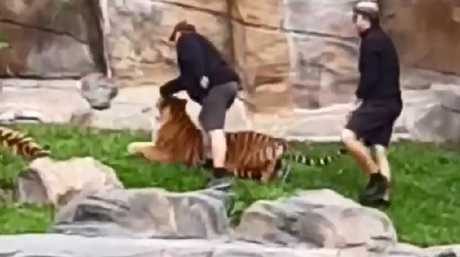 One handler appears to pull a tiger’s tail as the second handler comes forward. The second handler appears to strike the tiger twice on the head as tiger moves its head to the side and lays down. However Dreamworld was swift to hit back at claims the animals were harmed. General Manager Life Sciences Al Mucci said the care and welfare of their tigers was paramount, with all handlers highly experienced in working with tigers. The handler gave “open hand taps to the facial area,” according to Al Mucci. "The media commentary to the circumstance misrepresents the context of what was occurring in the brief footage," he said in a written statement. "The handler's actions to refocus Akasha were explained to guests immediately after the tigers were separated. "The tigers in this video were showing antagonistic behaviour and needed separating before they had an opportunity to hurt each other. Viewers of the footage were “disgusted” by the situation. "Open hand taps to the facial area is the safest way to refocus tigers who are challenging each other and this is consistent with the way in which tigers communicate with each other in similar situations. "The tiger's tail is one of its strongest parts of the body. Tigers and handlers routinely play with the tail. "Akasha and Kai are both 100kg animals and the intervention of our handlers prevented a situation that may have escalated." 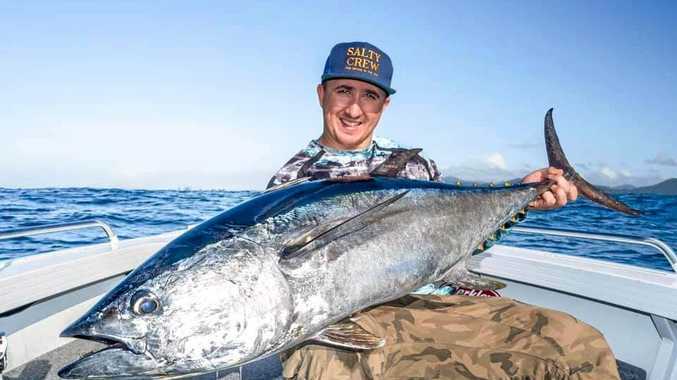 The RSPCA could not confirm at this point in time if they had the authority to investigate the matter or if it would be passed onto a relevant authority.